Recently, for the first time in my adult life, I discovered I couldn't fit into my regular jeans size. I haven't stacked on massive amounts of weight though; just enough to nudge the needle to the point where it's a little bit difficult to breathe when the button's done up. It's not a big deal; these things happen. The real problem is, jeans in the next size up are too big. I need to hoist my belt to within an inch of its life to prevent myself from dropping trou when I don't intend to (because, obviously, sometimes I intend to). Naturally, this situation leaves me in a quandary (in front of the laundry). Do I curb my enthusiasm for biscuits to get back to my original jeans size, or do I commit to the cause and fill out my new jeans size? Now, I know what you're thinking: What has this got to do with reviewing board games? The answer, of course, is nothing much, really. I just felt I needed to justify why I'm eating custard creams while I'm writing. Oh yeah... and I'm reviewing Candy Land. I figured an intro about gaining a small amount of weight was slightly more tasteful than an intro about diabetes. And I know what else you're thinking (this is getting spooky). 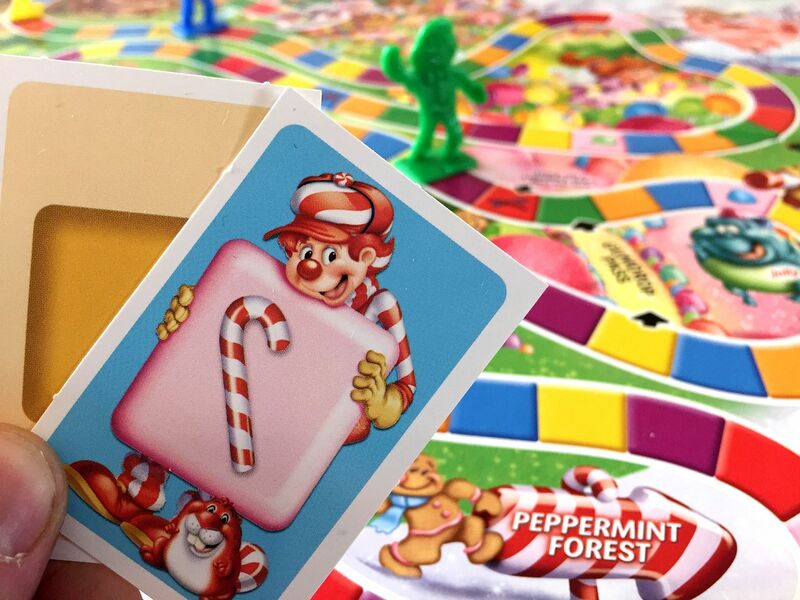 You're thinking, Candy Land isn't even a game. It's a joke. An insult. It's the label you put on any game that has dumbed-down design, old-fashioned "roll to move and miss a go" mechanisms, and limited (or no) in-game decisions other than whether to bother actually finishing. It's a game held in utter contempt, looked down upon by every serious gamer... and really, I just realised what an oxymoron "serious gamer" is... I mean, it's just rubbish, isn't it? There's no way I'm going to review it seriously, is there? Well, I sure as heck am going to review it seriously (or at least as seriously as I review anything). Because honestly. Candy Land isn't a bad game. 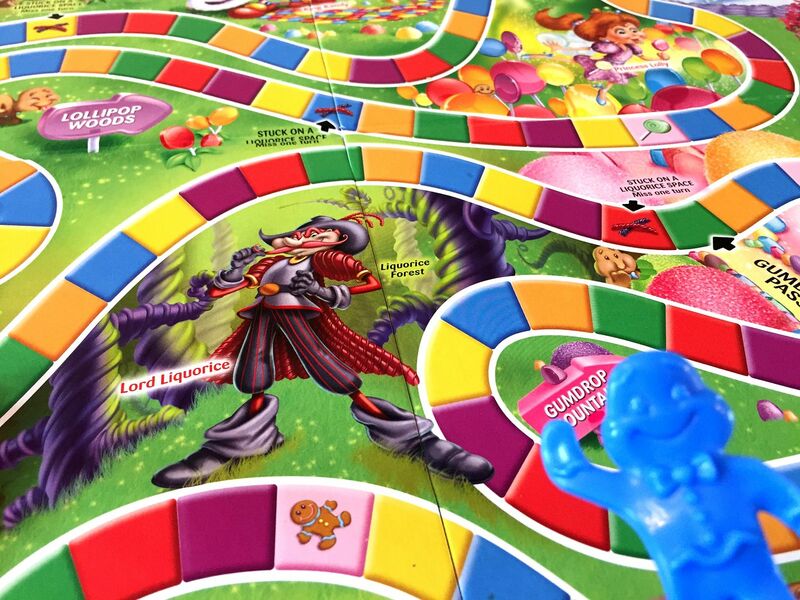 I've written before on my blog about judging games based on what they are, not on what they aren't, and never has that sentiment been more appropriate than when considering what Candy Land brings (or more accurately, doesn't bring) to the table. So, for anyone who doesn't know (and really, is there anyone who doesn't know? ), Candy Land is a game for toddlers. It's baby's first board game. Snakes and Ladders, but without the snakes, the ladders, the dice, the numbers... You know what? Forget that. Candy Land is basically Warhammer 40,000. Look the game up, and all you'll see are people saying it's terrible, and it's basically dying out. But someone keeps buying the damned game, because it's been an indelible mark (some would say stain) on gaming for decades. And people are buying it because what it sets out to do, it does very well. 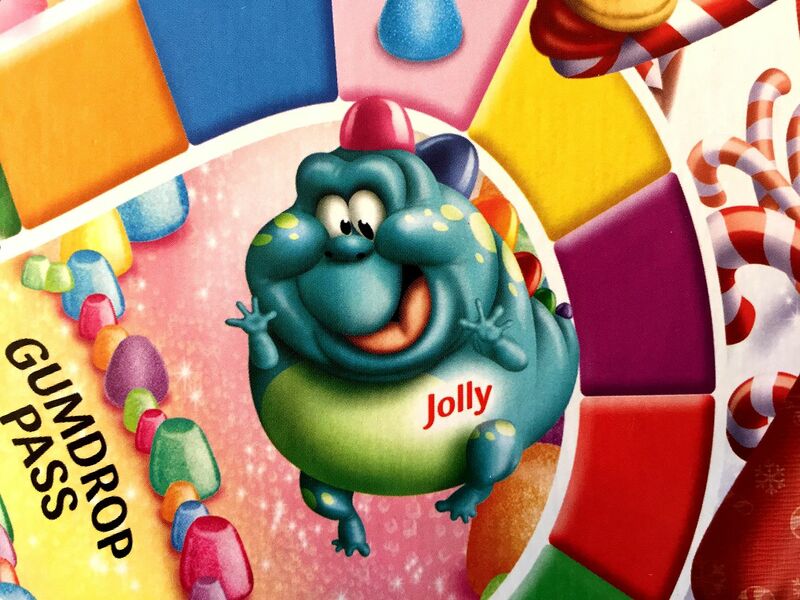 Incidentally, the original Candy Land dates back to the 1940s, and there have been quite a few iterations since then. Graphic design has changed, components have changed, even a few rules have changed; but for this particular review, I'm talking about a 2004 copy from MB Games that I picked up for the princely sum of 50p in a toy shop clearance. 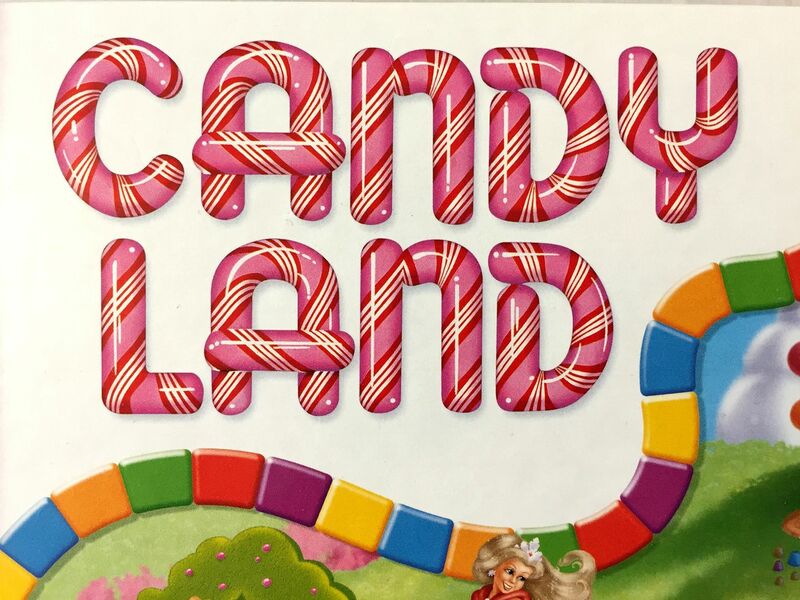 The premise of the game is simple: The King of Candy Land has invited you to his castle, probably for lunch. You're a gingerbread man (obviously), so the King's intentions might not be entirely honourable. Anyway, you and your gingerbread buddies have decided to accept the invitation and skip merrily to your doom along the rainbow road through Candy Land, stopping to say "Hi" to all the colourful characters on the way (my personal favourite is Jolly the Gumdrop Dragon; he's fricking adorable). To play the game, you simply draw from a deck of cards, and move your super cute gingerbread man pawn along the path on the board accordingly. If you drew a card showing a coloured block, you move forwards on the path until you reach a space matching that colour. If you drew a card showing two coloured blocks, you move along until you reach the second space ahead matching that colour. If you drew a picture card, you move directly to that picture. 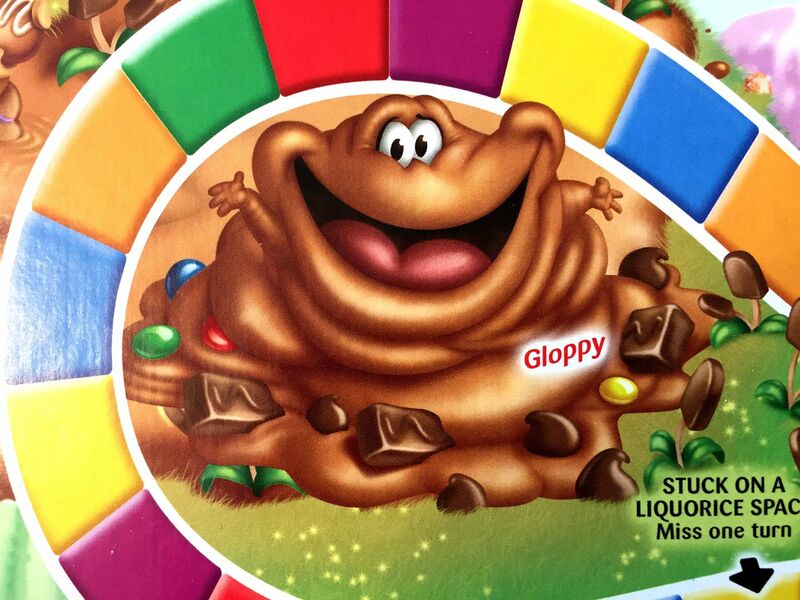 This is your opportunity to meet all of the fun Candy Land characters, such as the aforementioned Jolly, or the almost-as-wonderful Gloppy in the chocolate swamp. Along the way you may land on some liquorice. If you do, you miss a turn. Along the way, you may also land on a shortcut. If you do, you cut the short. And that's it. It's stupidly simple. Of course, that's its greatest strength, and also its greatest weakness. 1. It's incredibly quick to set up: Unfold the board, shuffle the cards, pick a gingerbread man, and you're ready to go. 2. It's incredibly fast to play: You should be able to hammer through at least three games in half an hour, even with very young children. 3: There's no skill: This may sound like a negative point, but it also means everyone is on a level playing field. This is really important with games for young children. You don't need to worry about handicapping yourself, and you don't need to worry about children failing to understand complex strategies. Everyone is just picking a card and moving to the relevant colour or picture, and even the youngest child gets to experience the thrill of winning. 4. 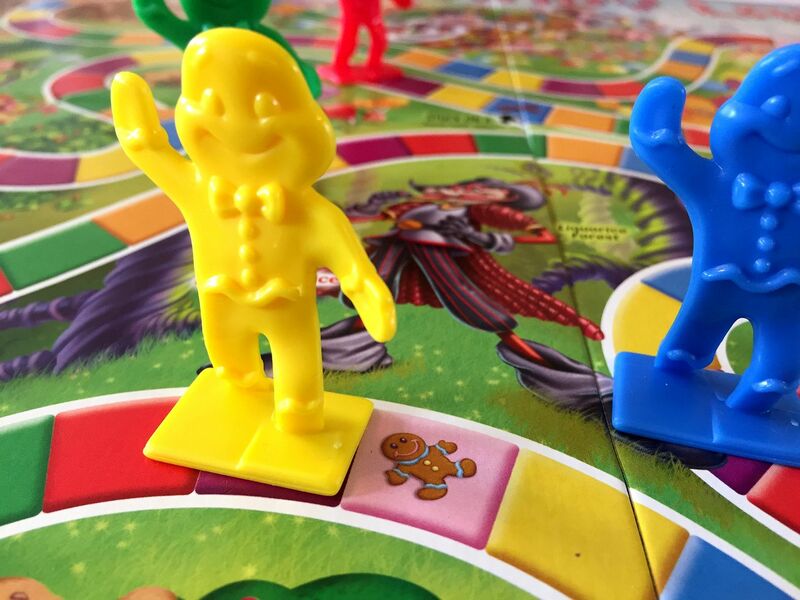 It teaches important gaming skills: Everybody starts somewhere, and Candy Land is a great game for teaching taking turns, fair play, moving pieces around a board, and being screwed by fate's fickle ways. 5. It's educational: Colour recognition is a core game mechanism. Additionally, although counting isn't necessary, you have the opportunity to encourage children to count out the spaces as they move to the next colour on the path. 6. It's for families: Nothing is more important than finding ways to bring the family together, and in the hectic modern world it isn't always easy. A simple game where even the youngest member of the family gets a chance to be actively involved is a wonderful way to spend a few minutes together, simply laughing at each other's misfortune and cheering when someone leaps forward on the rainbow path. 7. It's actually fun: Really, this is a fun game. I'm not being stupid. It's fun. Because it doesn't outstay its welcome, and because the whole family is involved, and because everybody is getting screwed by shonky card pulls, and because your little ones are going to be in fits of giggles as they race past daddy who was absolutely certain that he was going to bloody win this time if it wasn't for that damned, bloody, "miss-a-turn," bull-crap, liquorice space that he's somehow managed to land on four times already. As far as I'm concerned, those are all great "out of the box" reasons to give Candy Land a shot. But there's something else about the game that makes it even more appealing: It's easy to house-rule, so the game grows in line with how your children grow. For a start, the rules include a couple of variants. One is for younger children, and suggests you always move forwards on the path, regardless of what card you draw. The second variant (which I think is really how the game should always be played rather than a variant) is for older children, and suggests that on a turn you draw two cards, play one, and discard the other. This adds an extra bit of interest, and adds a decision point that encourages children to count out the spaces and make solid in-game choices. Draw two cards and pick one. If both cards show the same colour, add all the blocks together. This variant means you can end up moving from one to four spaces, depending on your draw, and builds in more counting. When playing with this version, I also add the rule that if you pull a picture card, you must play that picture card. If you pick two picture cards, you get to choose. Draw one card, move, and then push your luck. You can keep drawing as long as you pull cards of the same colour as your first card. If you pull a different colour, you have to move backwards to the most recent space of that colour and your turn ends. If your first pull was a picture card, you don't get to push your luck. This variant adds more decision points and teaches risk versus reward. Draw two cards, keep one, and pass one. You draw two cards, play one for yourself, and give the other one to another player to play immediately. This adds another decision point, and introduces younger players to the idea of "gotcha" cards. And that's just three. I could probably sit here all day suggesting other ways to use the cards to create different entertaining and educational situations. Just doesn't seem like a particularly constructive way to spend a day, does it? I'm not saying Candy Land is a masterpiece. I think it's something most children are going to grow out of very quickly. There's only so many times you can travel along that rainbow path, after all. But every journey starts somewhere. 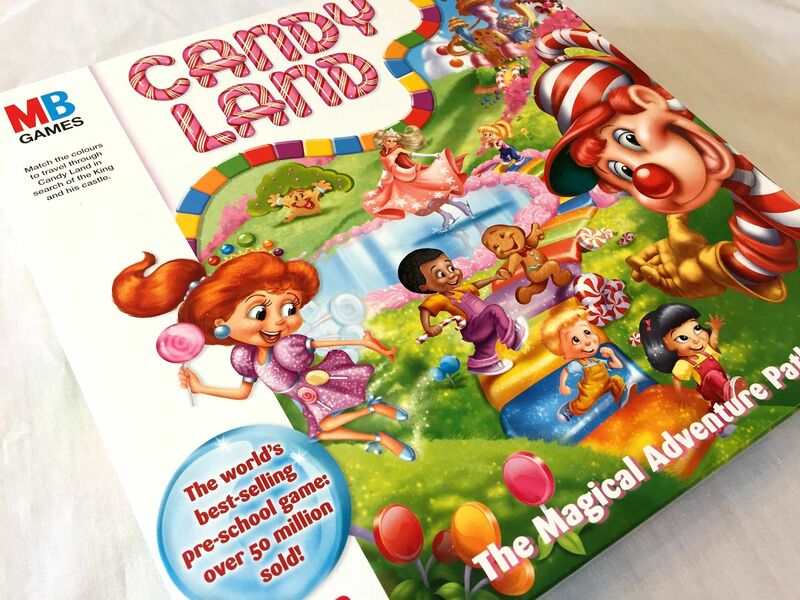 As a first step for introducing board games to very young children, a trip to Candy Land really isn't a bad idea. Candy Land is a good place to start discovering games. For more excellent games for all ages, check out Element Games. You get good games from good people, and you get to help out my blog a little bit too. Sound good?